Iran claimed to have successfully tested a new cruise missile with a range of 800 miles on Feb. 3, days after President Donald Trump warned about the threat emanating from the Islamic regime. Iran displayed the new missile on state television to mark the anniversary of the 1979 Islamic Revolution. 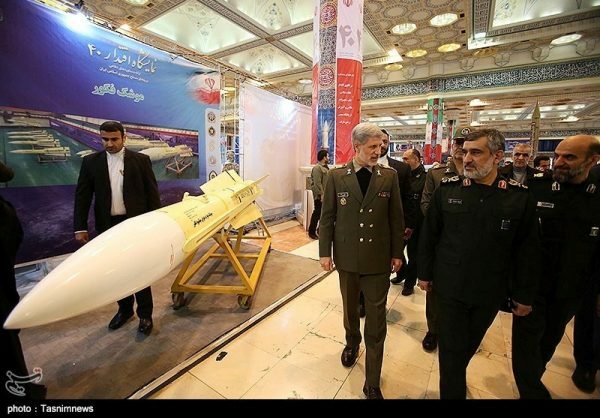 The surface-to-surface weapon, named Hoveizeh, is from the Soumar family of cruise missiles, which Iran added to its arsenal in 2015, according to Defense Minister Amir Hatami. “This cruise missile needs a very short time for its preparedness and can fly at a low altitude,” Hatami said. Later on Feb. 2, a senior Revolutionary Guard commander suggested that pressure by European countries for talks on curbing Iran’s ballistic missiles development could prompt Tehran to expand it beyond current limits. 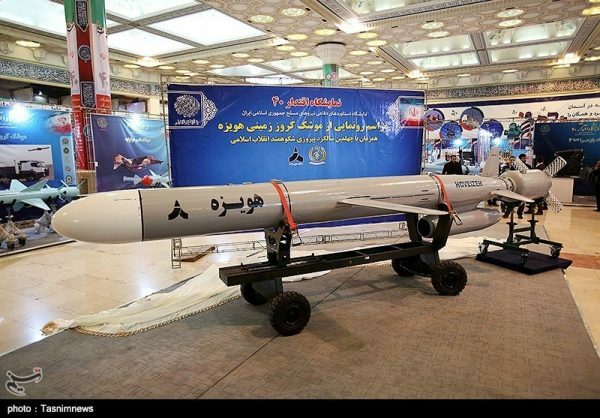 The Islamic regime has expanded its missile program, particularly its ballistic missiles, in defiance of opposition from the United States and expressions of concern by European countries. Tehran claims the program is purely defensive. Trump warned about the dangers posed by Iran on Jan. 30 while criticizing his intelligence chiefs for being naive about the threat from the Islamic regime. At an annual briefing to Congress on global threats to national security, Director of National Intelligence Dan Coats said that the threat from Iran is not particularly immediate. A day later, Trump met with the intelligence chiefs and said they are in agreement on the potent threat from Iran. The president said that his initial comment was in response to inaccurate news coverage on the intelligence community’s testimony. Trump pulled the United States out of the Iran nuclear deal and reimposed sanctions on Tehran last year. The sanctions have crippled Iran’s economy, although U.S. allies were given time to reduce their dependence on Iranian oil. Iran carried out a failed attempt to launch a satellite into space on Jan. 15, defying a warning from Trump. The carrier vehicle for the satellite uses similar technology to an intercontinental ballistic missile, triggering concerns that Tehran is developing weapons that can reach the United States and Europe. France, one of the remaining parties in the Iran deal, condemned the attempted satellite launch and urged Iran to discontinue all ballistic missile tests, which violate U.N. resolutions. 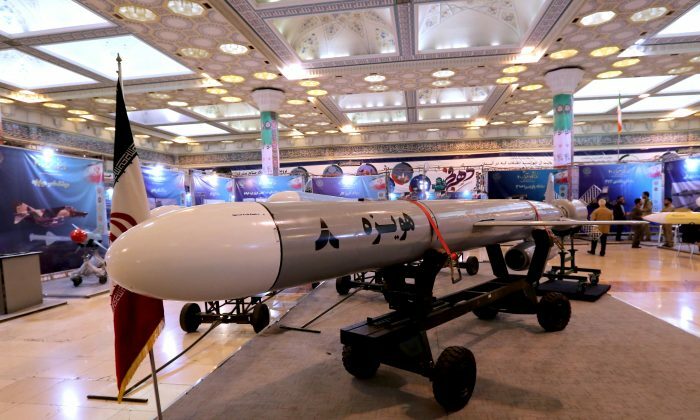 Iran had overcome initial problems in producing jet engines for cruise missiles and could now manufacture a full range of the weapons, according to Amirali Hajizadeh, head of the Revolutionary Guard’s aerospace division. The Defense Ministry’s website carried an undated video purportedly showing the Hoveizeh being test-fired from a mobile launcher. It quoted Hatami as saying the missile had successfully hit targets at a distance of 745 miles. Since agreeing to a 2015 nuclear deal with world powers, Iran has expanded its missile program despite warnings from the United States. Washington asserts that some of the tests and weapons, including the satellite vehicle, are in violation of a U.N. Security Council resolution that enshrined the Iran nuclear deal. The resolution called upon Tehran to refrain for up to eight years from work on ballistic missiles designed to deliver nuclear weapons. Iran said its missile tests aren’t in violation of the resolution, and denies its missiles are capable of carrying nuclear warheads. 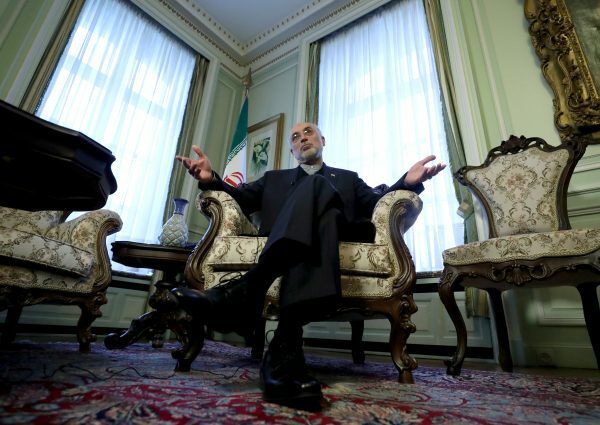 On Jan. 15, Iran’s atomic energy chief said that the Islamic regime has stockpiles of uranium enriched to 20 percent purity, a level that’s far above the 3.67 percent the Islamic regime agreed to not surpass as part of the Iran deal. On Jan. 8, the European Union imposed the first set of sanctions on Iran since some of its members signed onto the Iran nuclear deal. The measure froze the assets of an Iranian intelligence unit and two of its staff. On the same day, the Netherlands accused Iran of two killings on its soil and joined France and Denmark in alleging Tehran plotted other attacks in Europe. Brig. Gen. Hossein Salami, deputy head of the elite Revolutionary Guard, again rejected any talks on Iran’s missile program, in response to a demand raised by France and other European countries, according to Fars. Salami said Iran’s decision to limit the range and the number of its ballistic missiles is based on its current strategy, which could change based on circumstances. “If today, the Europeans or others try to plot and pursue Iran’s missile disarmament, then we will be forced to resort to a strategic leap,” Fars cited Salami as saying, an apparent threat that Iran may seek to boost the range or the number of the missiles. Epoch Times reporter Petr Svab contributed to this report. Reuters and The Associated Press contributed to this report.